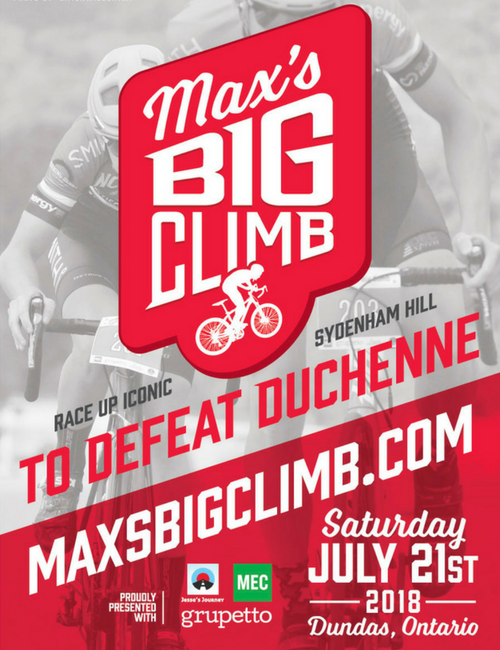 Max's Big Ride is partnering with Dundas' premiere coffee and cycling destination, Grupetto and Burlington's MEC to present the third annual Max's Big Climb - to raise money for a cure for Duchenne muscular dystrophy. 100% of the proceeds from this event will go to help find a cure for DMD via the registered charity Jesse's Journey. One hundred years ago the route up Sydenham Hill was known as Horse Kill Road, 'a climb that taxed the strength of oxen but was beyond the strength of horses'. More recently Sydenham has been made famous by decorated Canadian Olympian Clara Hughes and been ridden over 23,000 times on Strava. This year will see an individual time trial, the King and Queen of the Mountain contest and for the first time, we'll be inviting younger riders to tackle Max's Big Climb as the first stage of the Franklin Templeton Investments Youth Mini Tour. Thanks to SPOKZ Cycling and The Brian Karschti Realty Group we will have $600 of prize money on offer this year! We'll have $200 each for any man or woman who sets a new record on the hill plus $100 each for the King and Queen of the Mountain champions. In addition we'll have 6 packs of Shawn & Ed Beer for the fastest men + women in the 30-39 and 40+ categories and a brewery tour + tasting for our Lantern Rouge. Max's Big Climb promises to be an exciting event for both riders and spectators and a staple of the local cycling calendar in years to come. Riders will race the hill individually against the clock. All riders will be professionally timed and ranked according to their gender and age groups. The fastest rider in each category will be recognized and awarded a race ribbon. The fastest eight men and women will progress to the King and Queen of the Mountain competition below. The fastest eight men and women overall from the individual time trials will be seeded for the head-to-head Knockout Stages. In the Knockout Stages, winners will advance and race twice more to determine a 'King' and 'Queen of the Mountain' for 2018. We are encouraging all riders to gather pledges from their family and friends to help fund this all important research. Your efforts could help make Max's generation the first to survive this fatal disease. Click here to learn about our cool incentives. Race the hill against the clock. You will be professionally timed and ranked within your age category. 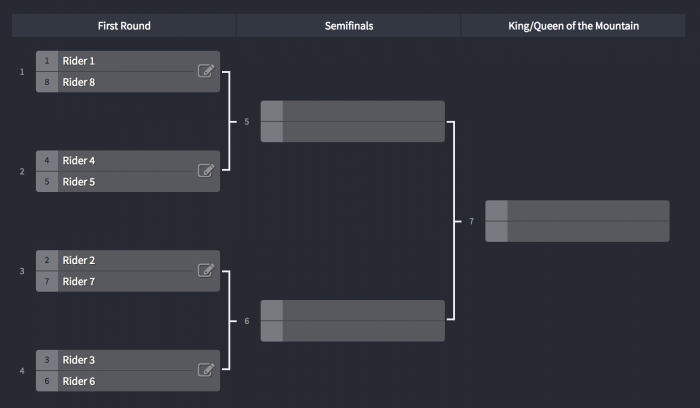 The fastest 8 men and 8 women will advance to the King + Queen of the Mountain knockout rounds. Each rider will get two attempts at the hill.